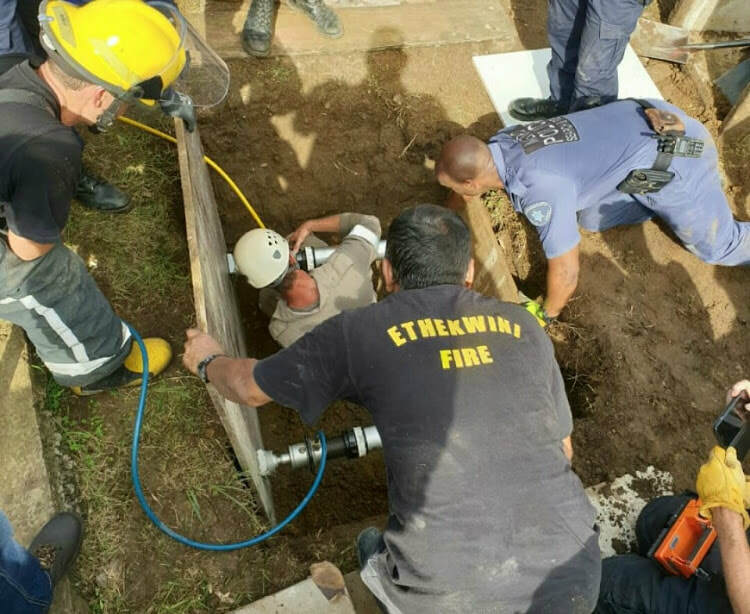 A baby girl has been freed from a storm water drain in a three-hour rescue involving eThekwini Fire and Rescue Services, Durban University of Technology, Durban Metro Police, South African Police Service Search and Rescue, KwaZulu-Natal (KZN) Emergency Medical Services and Rescue Care, on Monday morning, 11 February 2019. Authorities were called out to the scene at the corner of Herring Circle and Barracuda Rd early on Monday after people walking by heard the baby cry. 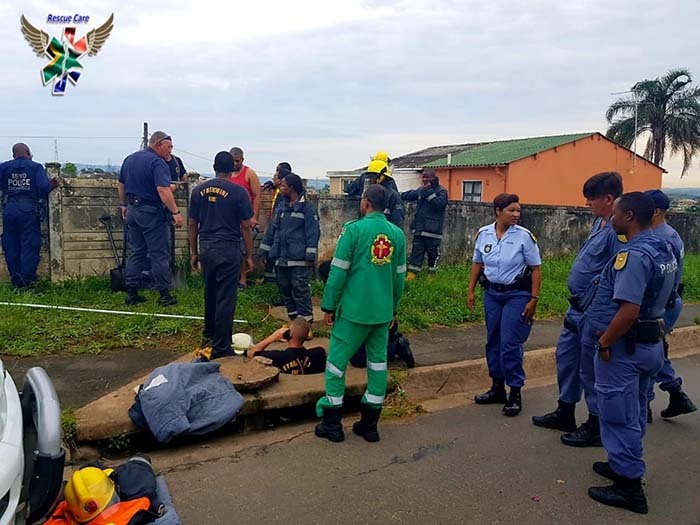 Commanding officer at the rescue, eThekwini Fire and Rescue’s Jesse Yasudas, says the call to respond came in at 9h30. Two general rescue pumpers from Durban North Fire Station and Ntuzuma Fire Station were immediately dispatched. 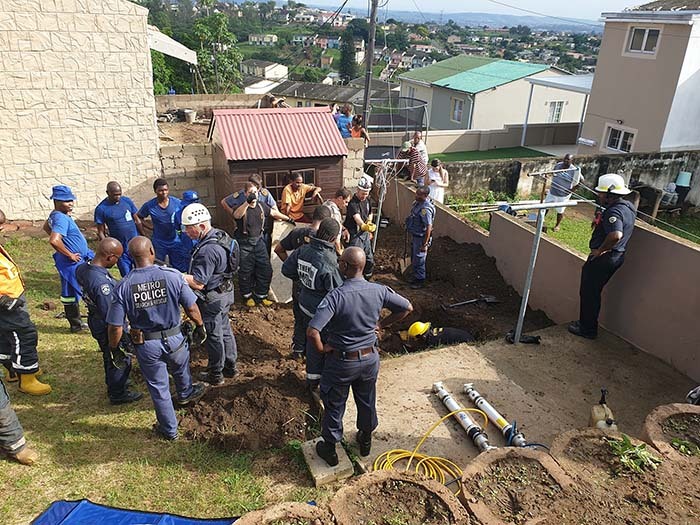 Police rescue teams already on the scene decided to start digging a hole above the ground in an effort to save the child, before calling eThekwini Fire and Rescue Services. 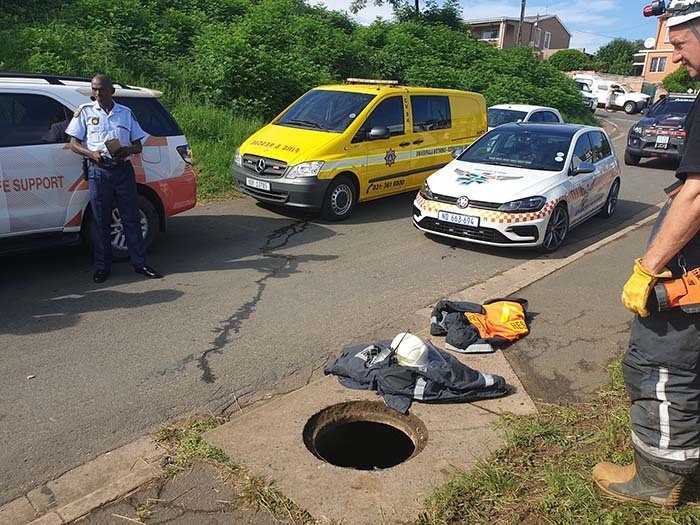 Brad Hatfield, Durban North station commander, entered the man hole on the pavement outside the property where the cries could be heard, to assess the situation. 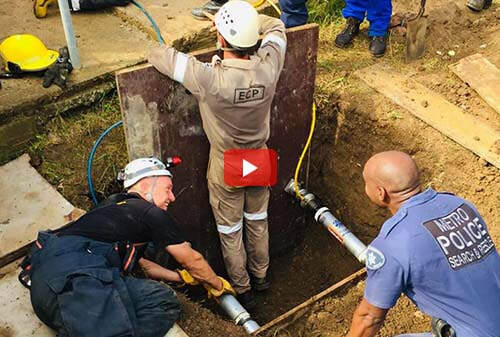 At the bottom of the two-metre deep hole, was a drain, approximately 300mm in diameter running horizontally at a gradient of about 30 degrees in the direction of the private property. Hatfield could see the baby in this pipe and used a tape measure to determine how far in she was lodged. The corresponding measurement of about seven metres was measured above ground to determine the dig area. 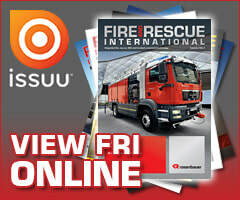 Yasudas said that a call was put out to all stations for the thinnest, smallest fire fighter in the brigade. 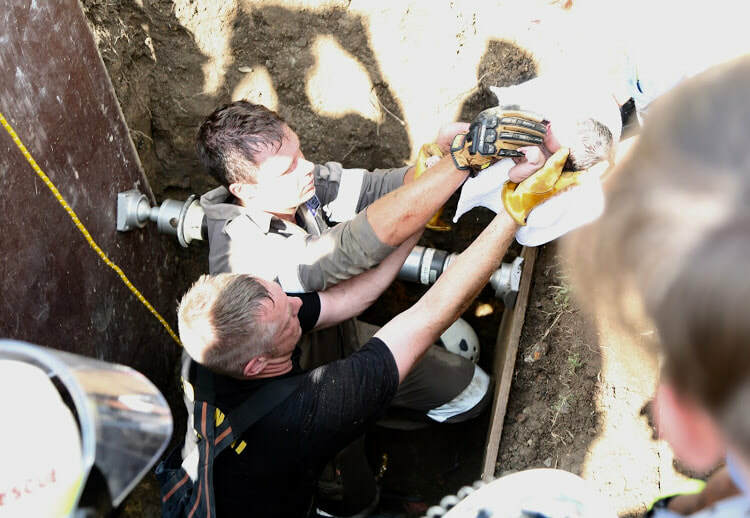 The thin fire fighter arrived and attempted to fit into the hole but was unable to reach the infant. 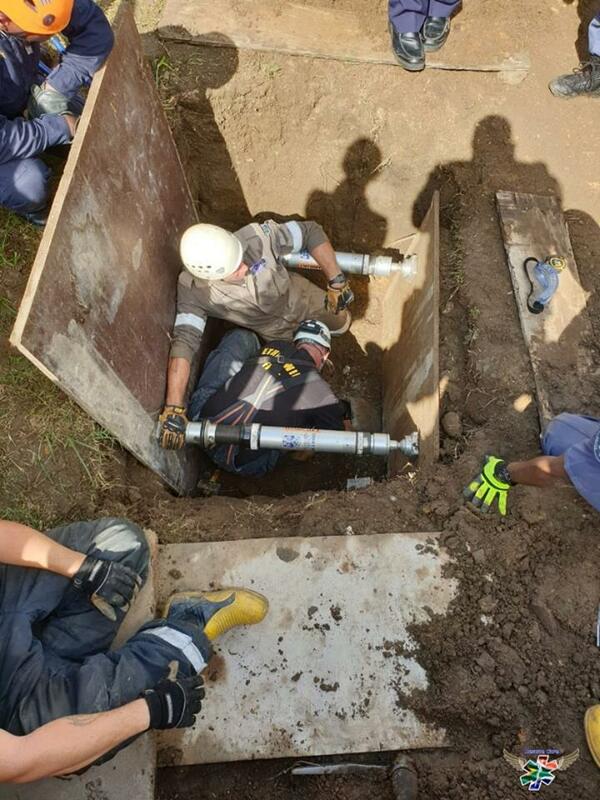 Shoring was brought in and digging above the pipe was initiated. A back hoe loader was on standby but was not needed. 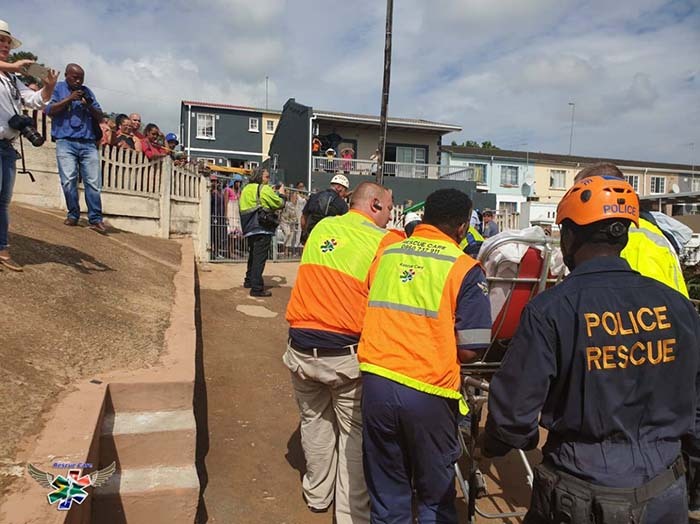 eThekwini’s storm water division was on hand to assist as well. 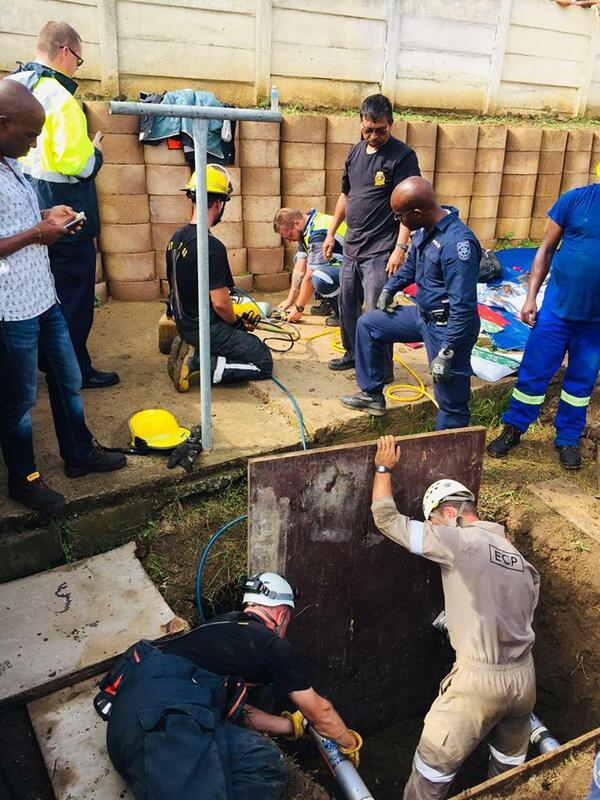 A hole 1,5 square metres was dug above the baby’s estimated location. 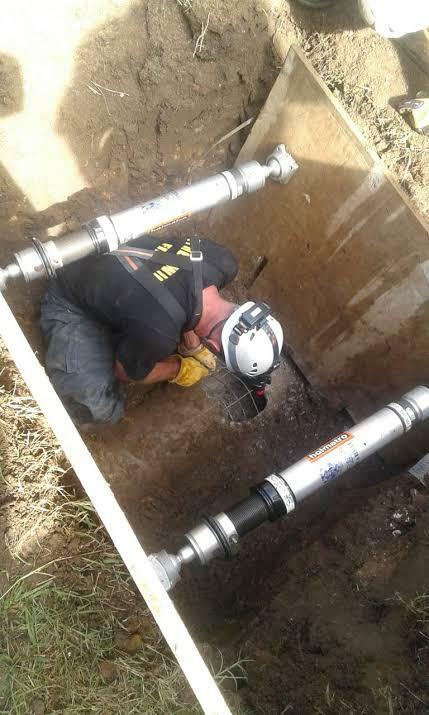 The distance down to the pipe was another 1,5 metres. 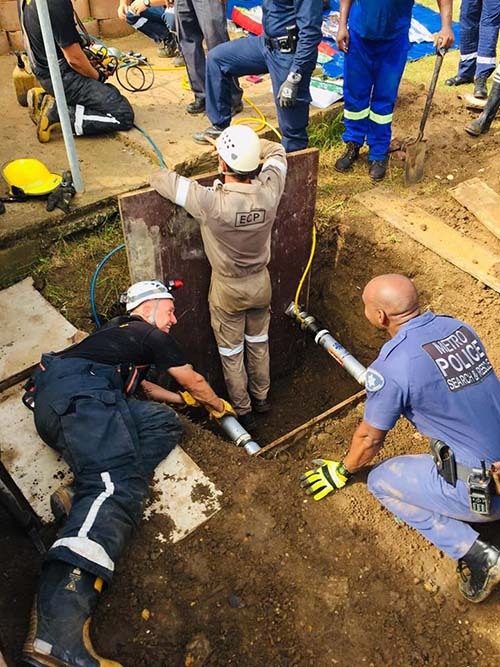 The hole was shored, with the assistance of Durban University of Technology’s Keagan Reynolds, with boards and hydraulic struts. 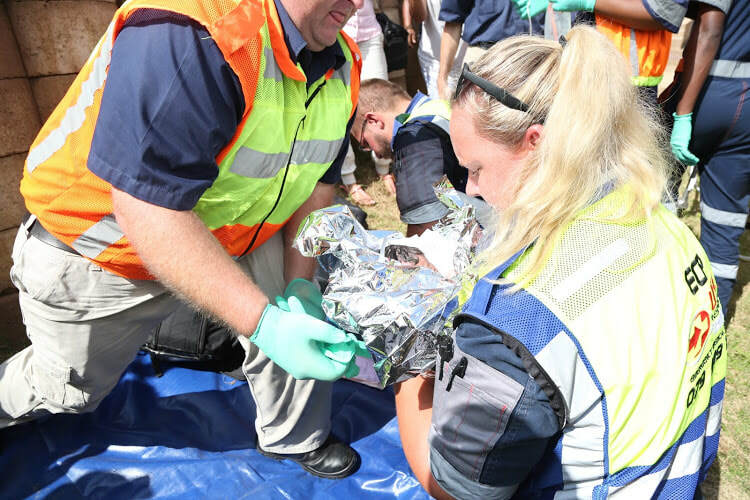 Reynolds currently heads the technical and medical rescue at the DUT across all levels of the Bachelor of Health Sciences degree. 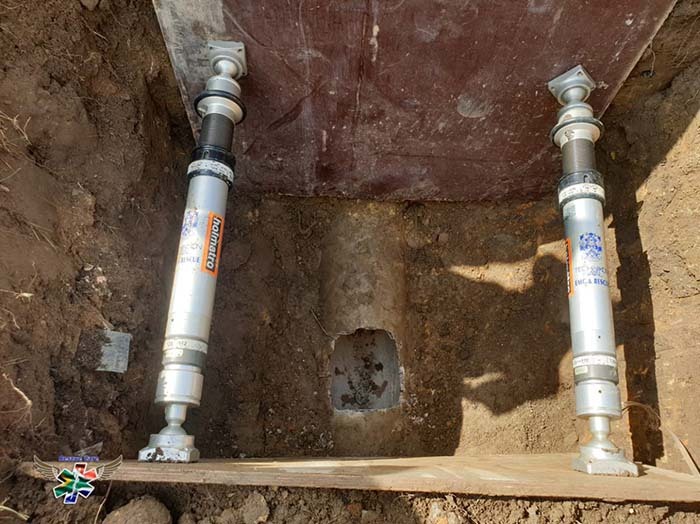 Utmost care was used in cutting open the pipe once it was exposed, hand tools were used to reduce noise and dust as much as possible. Hatfield says the pipe was reinforced with rebar, which made breaching it extra challenging. 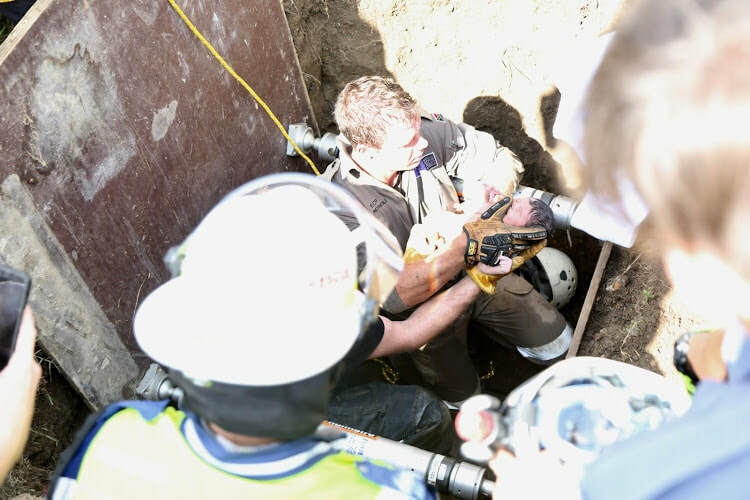 Once the pipe was opened, the baby was observed to be about another 1,5 metres along. She was pulled to the opening with ropes until she could be reached. The child was assessed by paramedics at the scene and seemed healthy. 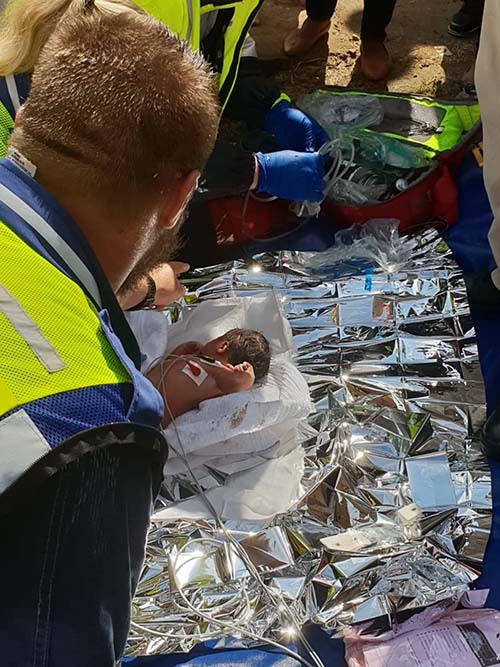 "The baby has been safely removed out of the storm water drain alive and is been stabilised on scene before being loaded into the AMS medical helicopter," said Rescue Care’s Garrith Jamison. 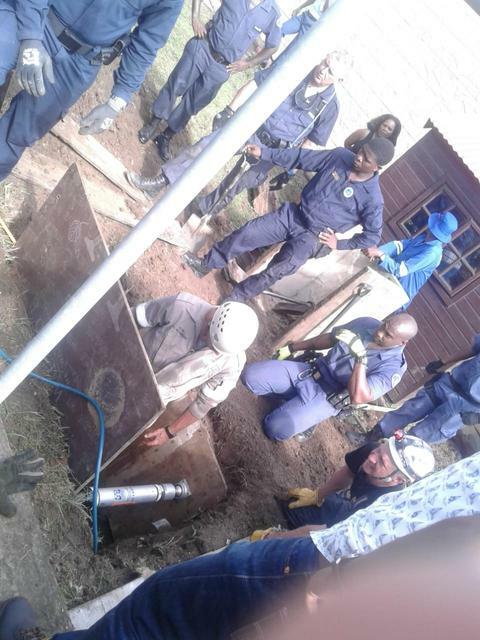 KZN EMS spokesperson Robert McKenzie said, “It’s good news for the ending of this rescue today. 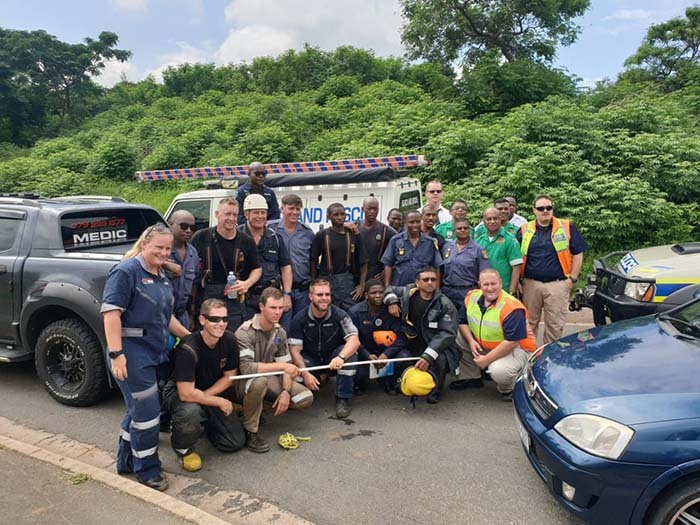 We would like to congratulate the rescue personnel and paramedics who worked together to rescue this little girl today. 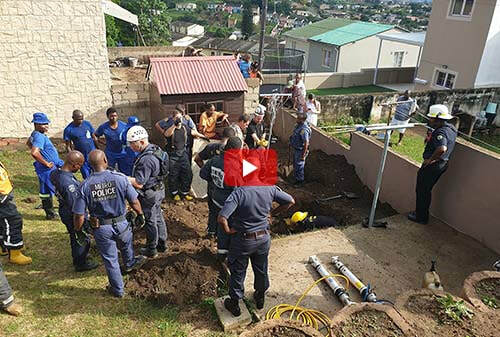 The community was very helpful and supportive which we are also grateful for.” He said the baby was airlifted to Albert Luthuli hospital. 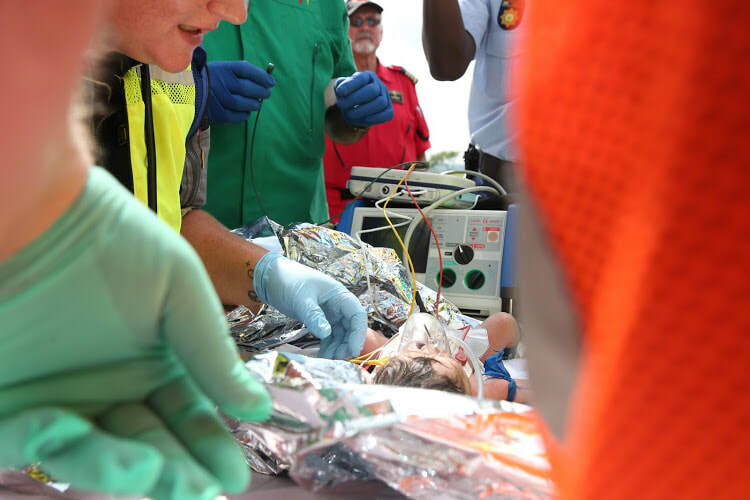 Dr Timothy Hardcastle was on call at Chief Albert Luthuli Central Hospital when the newborn, believed to between one and three days old, was brought in after a gruelling three-hour rescue. 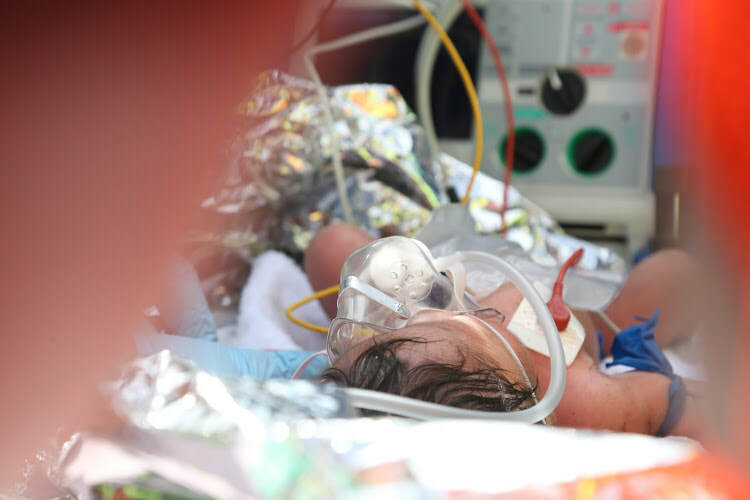 "I think any child who survives any amount of hours and it sounds like it was at least four to five hours, in a storm water pipe on days two or three after birth is a miracle. It is mercy from above that she is alive," said Hardcastle. 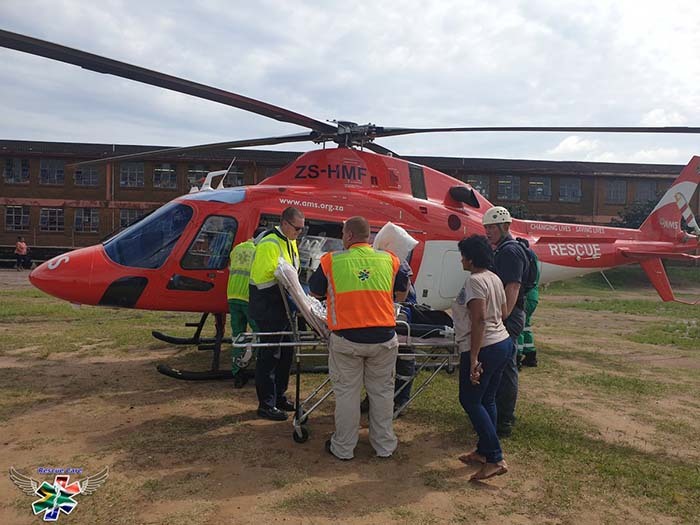 Hardcastle, the chief trauma specialist at the hospital, said the little girl was healthy and in good spirits, besides having mild hypothermia on arrival. "She has been awake, responsive and crying ... She is basically stable enough for transfer to one of the base hospitals where they can sort out the social side. 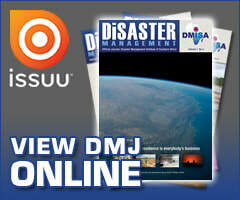 But from a medical point of view, things are looking good," he said. 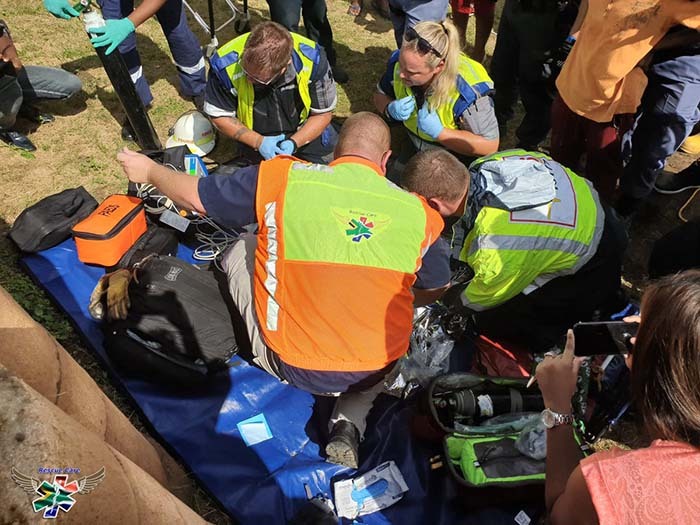 KZN health MEC Dr Sibongiseni Dhlomo, who went to the hospital to see the newborn, said the baby would be moved to a smaller hospital, then discharged to a place of safety. "This matter will have to be investigated, to find the parents," he added. 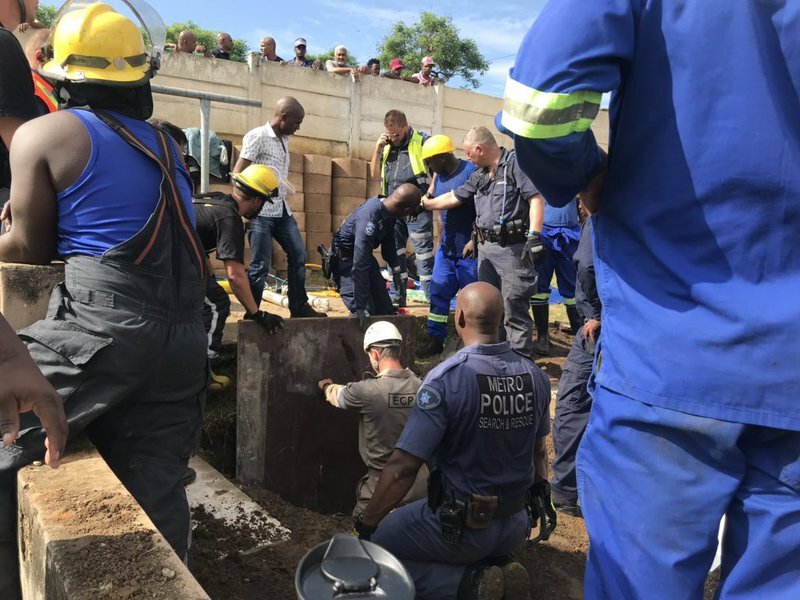 A case of attempted murder was opened at Newlands East police station, said KZN police spokesperson Col Thembeka Mbele.